Can you think of two more iconic late fall seasonal harvests than pumpkins and cranberries? At first I thought it was an odd idea to combine them, even though I wanted to. 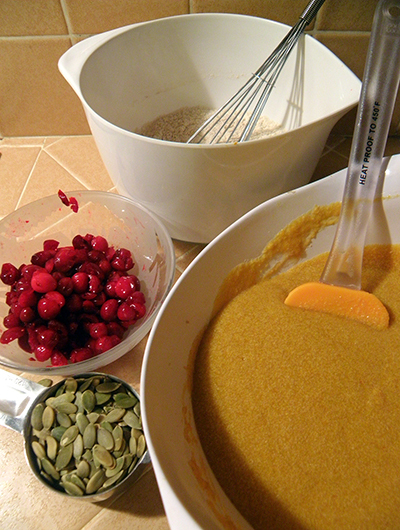 Then I experimented with Pumpkin-Cranberry Bars last year and the flavors blended harmoniously, enhanced by a few spices. This year I’m going for the muffins. 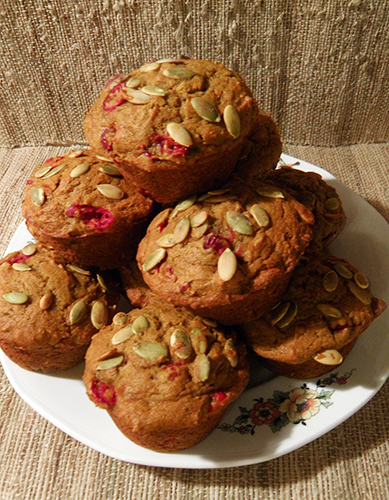 The recipe is based upon my Raisin Date Persimmon Muffins or Cake, another fall/winter-friendly seasonal recipe. Pumpkin seeds add an unexpected flavor, irresistible crunch, and make this recipe appropriate for groups in which someone might have nut allergies. As I noted not too long ago, muffins aren’t what they used to be. They’re bigger and more mountain-shaped, even when not homemade. The flatter, old-school muffins I used to make a decade or two ago look sad at potlucks. 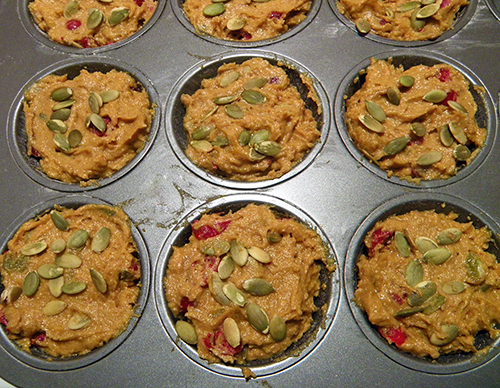 So I’ve taken to filling the muffin tins to the top before baking, rather than 2/3 full, as older cookbooks advise. Presto: instant perky rounded-top appeal. Just remember to fill any unfilled muffin tin sections 2/3 full of water, to ensure that muffins cook evenly. The most important thing to remember about making muffins is not to overmix them, or they will be tough and have trouble rising. I have made this mistake so many times! So now I mix all the dry ingredients together, then mix all the wet ingredients together in proper order (see recipe), then prepare any additions such as fruit, nuts, seeds, lemon peel, etc. When all ingredients are prepared, I add the dry ingredients to the wet and stir, but only until wet and dry ingredients are half-blended. Then I add the fruit, nuts, and anything else that’s going in and stir until the batter is just uniform. A spoonula helps because you can scrape the bottom of the bowl to bring batter to the top for mixing with the fruit and nuts. Although I wrote the recipe to use buttermilk, I rarely have it on hand. An easy substitute is ¼ cup yogurt stirred till smooth with ¼ cup + 2 tablespoons cow’s or soy milk. The acid in the buttermilk or yogurt reacts chemically with baking soda, helping the muffins to rise by releasing carbon dioxide. This recipe makes approximately 1 dozen standard size muffins. For the holidays, mini-Bundt cakes are a fun giveaway for guests, neighbors, and colleagues. This recipe will make 6 Bundtlettes; baking time is about 35 minutes. You might even want to try this in an angel food cake (tube) pan, in which case baking time would be about 55 minutes. In any case, test with a toothpick, per the recipe. As always, feel free to change the spicing and/or add other fruits and nuts. Post a comment to let us know if you come up with a winning combo. As the holidays approach and schedules get a bit crazy, I hope you’ll be able to take some precious moments to relax and enjoy these muffins with friends and family. 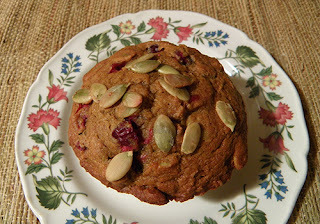 Chop cranberries and sprinkle with 1 tsp. evaporated cane juice (sugar). 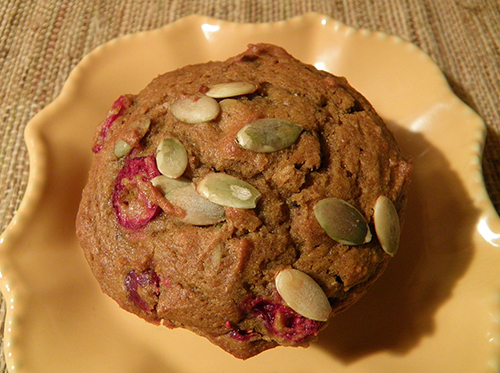 Allow 1 hour for cranberries to absorb sweetness. Sift and measure unbleached and whole wheat pastry flours. 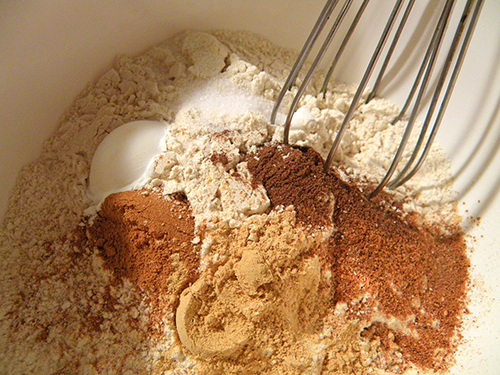 Combine with baking powder, baking soda, salt, cinnamon, ginger, nutmeg, and allspice, using a whisk. Set dry ingredients aside. Cream butter. Add brown sugar and cream together. When well mixed and fluffy, beat in one egg at a time. Stir in buttermilk, a little at a time, until completely mixed. Stir in pumpkin puree until batter is smooth and consistent. Stir mixed dry ingredients into the pumpkin mixture until half-mixed. 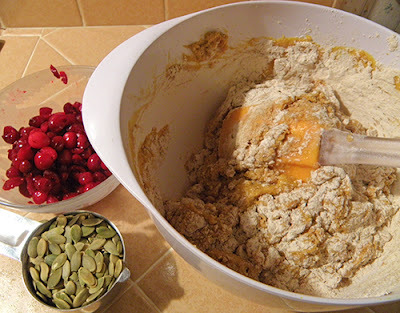 Add cranberries and ½ cup pumpkin seeds and continue mixing until just blended, scraping the bottom of the bowl with a spoonula. 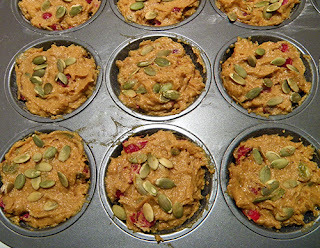 Spoon batter into muffin tins, filling to the top, or ¾ full, if you prefer. Sprinkle muffin tops with remaining 2 tbsp. pumpkin seeds. Bake until toothpick comes out clean, about 25 – 30 minutes.